ClearType is a technology that makes fonts look clearer and smoother on a display. ClearType is particularly effective for LCD and LED displays but can have some effect on CRT displays as well. Windows 10 supports ClearType. To adjust ClearType on your Windows 10 computer, first open the Display applet from the Control Panel. Then click Adjust ClearType Text. The ClearType Text Tuner appears. The ClearType Text Tuner is a wizard that steps you through a couple of settings to fine tune the font display on your computer. Select the Turn On ClearType check box and then click Next. 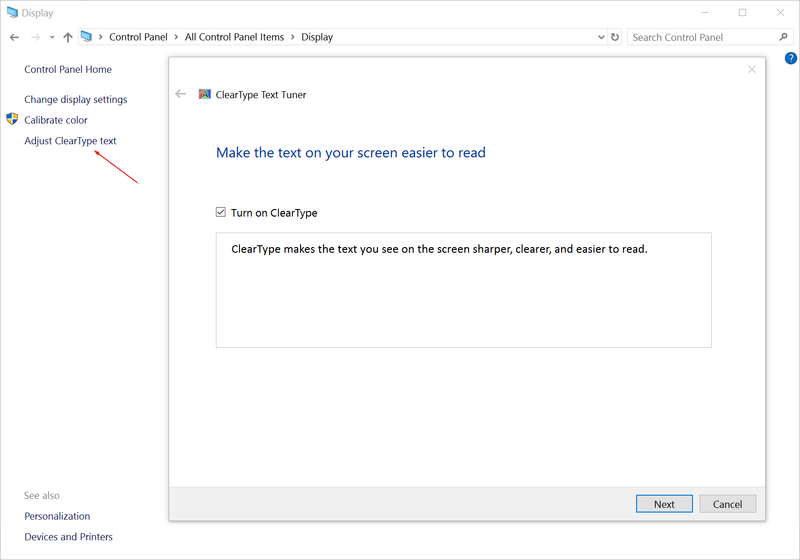 Windows 10 checks your computer’s display resolution and offers to change resolution to the display’s native resolution or keep the current resolution. Choose the desired option and click Next. Windows 10 then displays four pages with different text samples, prompting you to choose the ones that look the best to you. Click Finish when you’re satisfied with your selections. chat_bubbleCommand for auto populated text verification. chat_bubbleHow to return the focus to original frame after entering text in tinymce?